XYIENCE, the official energy drink of the Ultimate Fighting Championship (UFC) announces that UFC fighter Dan “The Outlaw” Hardy has joined its team of brand ambassadors by signing an exclusive promotional contract, effective immediately. LAS VEGAS, NV (February 13, 2010) — XYIENCE, the official energy drink of the Ultimate Fighting Championship (UFC) announces that UFC fighter Dan “The Outlaw” Hardy has joined its team of brand ambassadors by signing an exclusive promotional contract, effective immediately. The 27-year-old British welterweight has been fighting professionally since 2004. He has held titles with Cage Warriors, including Light Welterweight and Welterweight World Champion. In 2008, Hardy signed with the UFC, and now has an overall mixed martial arts (MMA) record of 23-6-0. In March, he will become the first British fighter to compete for a UFC title when he faces the current UFC Welterweight Champion, Canadian Georges St. Pierre, at UFC 111 on March 27, 2010 at the Prudential Center in Newark, NJ. 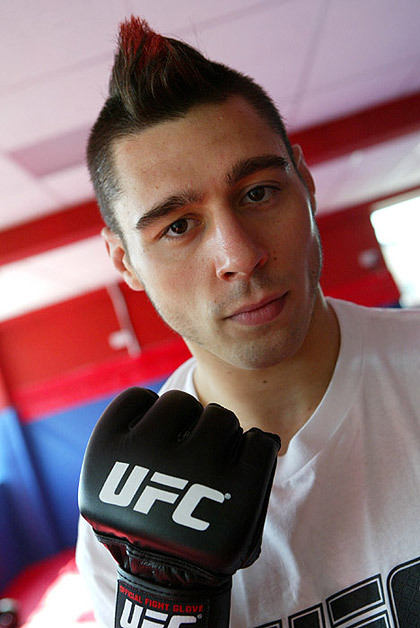 “In addition to being one of the finest fighters in the UFC, Dan Hardy is a unique individual –a dedicated athlete and highly creative artist. He approaches mixed martial arts with the same raw passion as his own art –deeply intuitive yet still influenced and inspired by his teachers and coaches,” says Jessica Lautman-Hughes, XYIENCE’s senior marketing specialist, who heads up fighter relations. Hardy, a former personal trainer, began studying traditional martial arts at the age of six, and became interested in training for MMA in 2002. Close to finishing his degree in contemporary art, Hardy left the Nottingham Trent University in his final year to devote himself entirely to his MMA training. He is known, however, for spending a great deal of time with his sketchpad, which is always in tow. He has even been referred to in British newspapers as the Picasso of Pain. “Dan has spent a lifetime training, and as a former personal trainer himself, he brings so much to the table for XYIENCE. We’re looking forward to working with Dan in the months ahead on some very exciting projects,” adds Lautman-Hughes. For XYIENCE, Hardy’s role as a brand ambassador opens the door for marketing and promotional ventures that incorporate the athlete’s expertise in fitness and nutrition as well as his notoriety among the brands core demographic, MMA and UFC fans. Hardy joins current XYIENCE team athletes, UFC fighters Wanderlei Silva and Matt Serra. place on or next to the XYIENCE and Xenergy logos, translating into millions of viewer impressions for XYIENCE. Internationally, XYIENCE reaches more than 420 million television households via UFC and Pay-Per-View broadcasts. XYIENCE supports the mixed martial arts lifestyle. Its energy drink, Xenergy, and its energy shot, X Shot, are the official energy drink and energy shot of the Ultimate Fighting Championship (UFC). The first energy drink created by a nutrition company, Xenergy has zero calories and is a sugar-free drink fortified with vitamins. All-natural flavors provide a consistent supply of energy, sans the “crash” inherent with most other energy drink brands. Xenergy Premium Energy flavors include Cherry Lime, Cran Razz, Mango Guava and Blu Pom. Xenergy Xtreme Energy flavors include Lemon Blast, Citrus Slam, Cherry Rush and Apple Jak’d. Xenergy is available in retail stores throughout the United States and Canada. Visit www.xyience.com for details. XYIENCE supplements provide ultimate nutrition for peak performance. With everything from NOX-V2—for increasing strength and stamina and aiding in post-exercise recovery—to high-quality protein supplements such as the XY-PRO, an advanced protein complex or the XM2 muscle meal, XYIENCE offers products scientifically formulated for specific training needs.